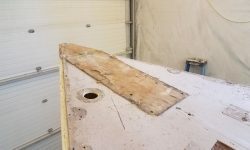 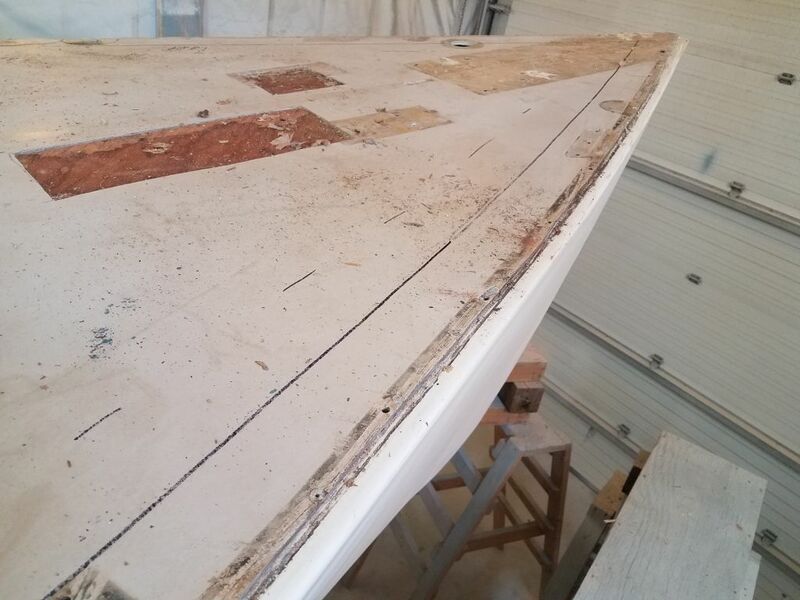 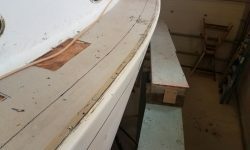 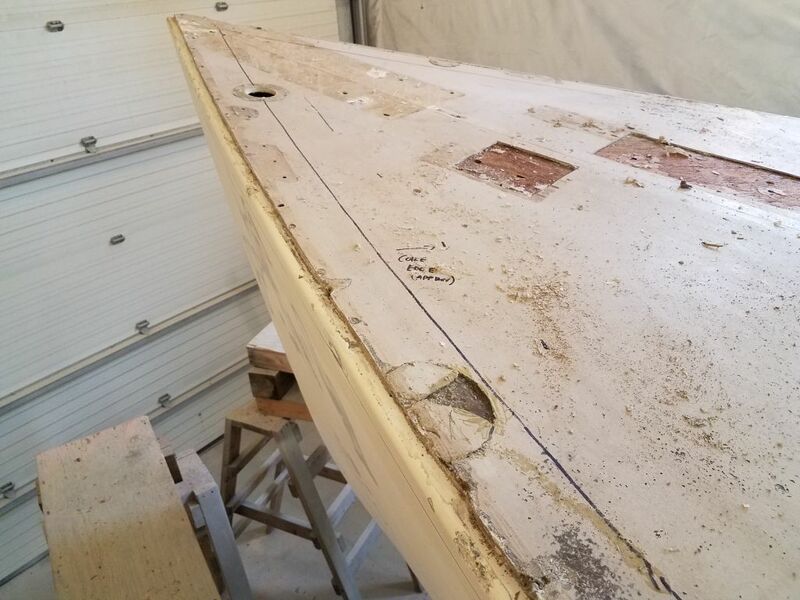 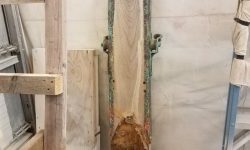 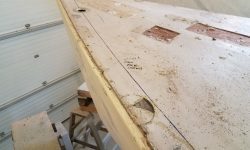 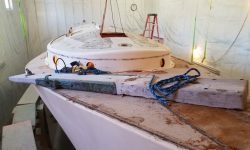 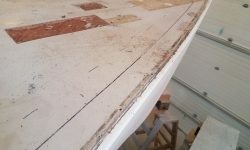 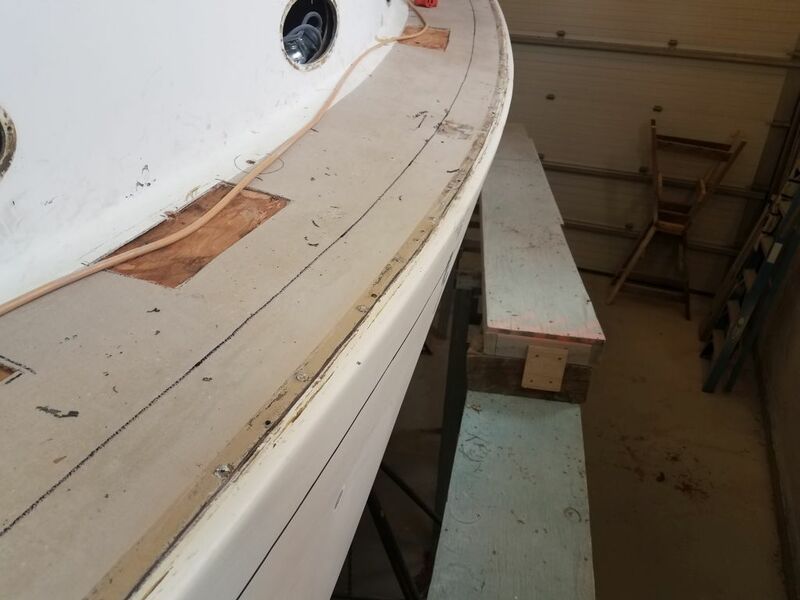 With plans to reinforce and glass over the hull/deck joint, there was now no question that I needed to remove the bowsprit. 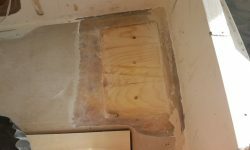 I’d postponed this for various reasons, but never truly thought it would end up staying in place–there were always too many reasons to remove it, even if the existing platform was re-used. 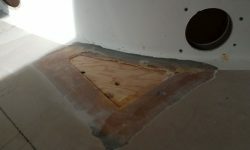 I proceeded carefully to as to save the platform without damage. 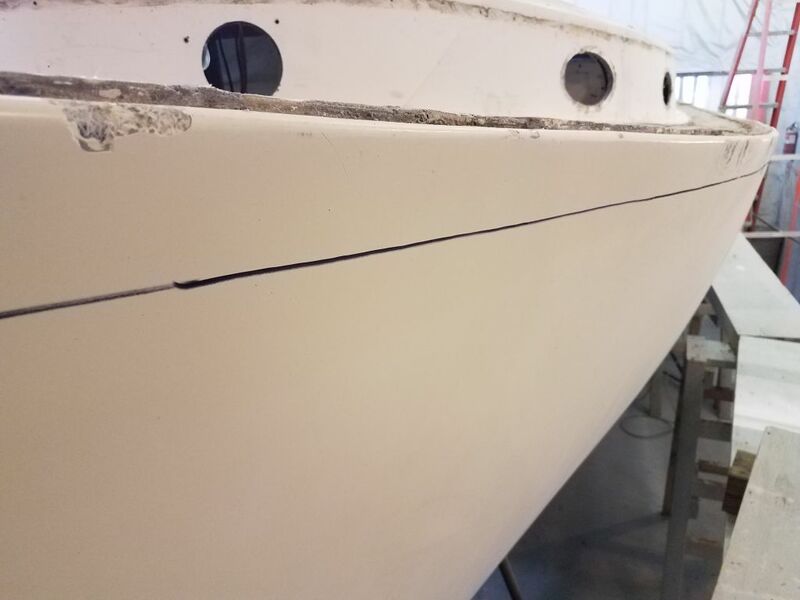 With things about to get dirty and nasty in the shop with some major deck work ahead, now seemed the best time to take care of this removal. 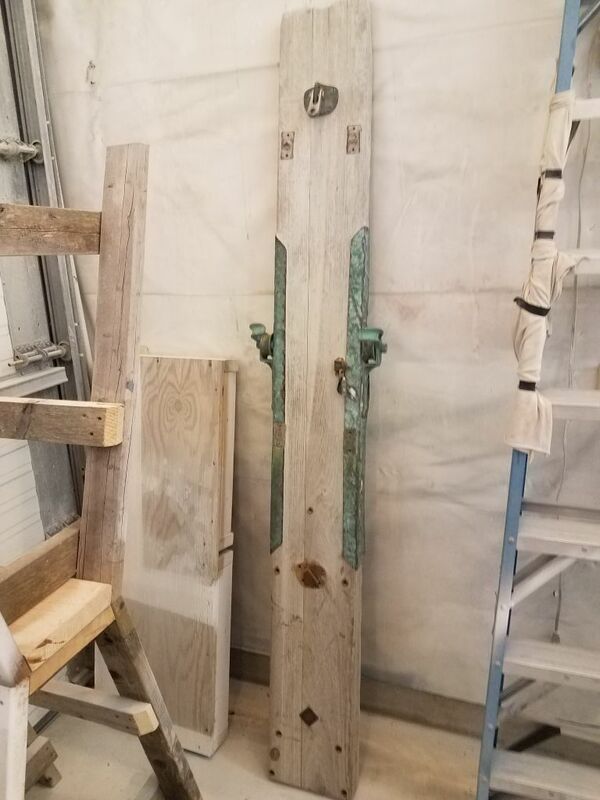 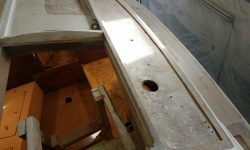 The platform was secured through the foredeck with 11 bronze carriage bolts, including four through the inner forestay attachment point. 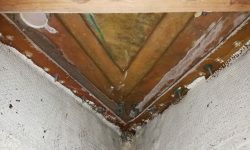 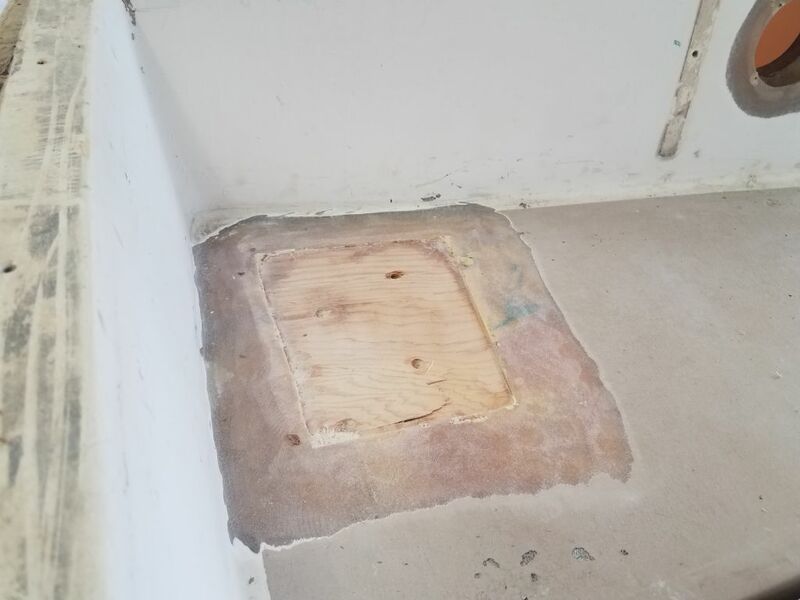 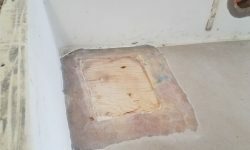 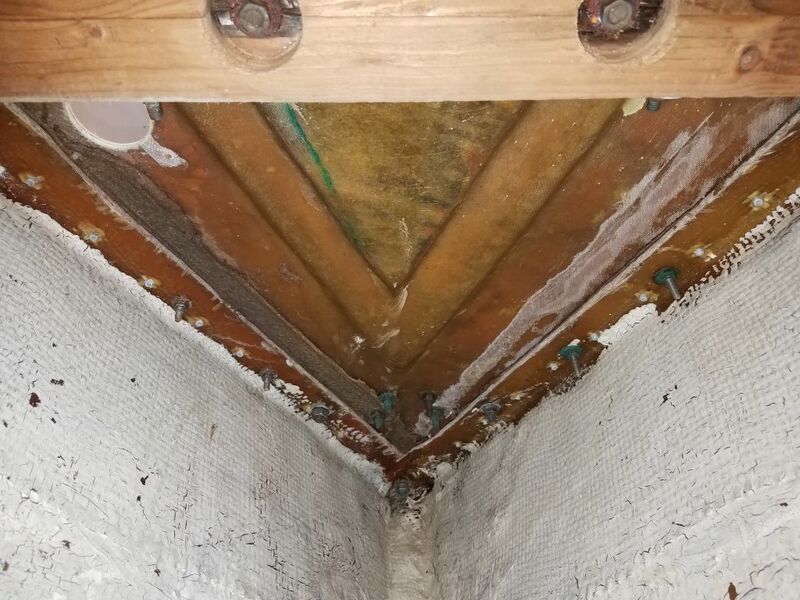 Even before removal, I could see a thick bed of silicone sealant beneath the platform that promised to make removal challenging. 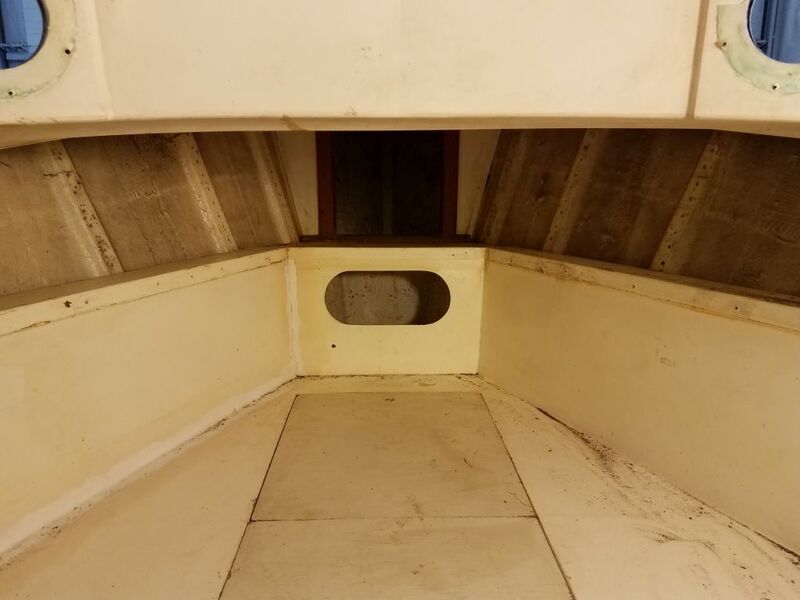 Access to the bolts from the chainlocker was tight, as the opening into the chainlocker was not only small, but awkwardly placed thanks to a stepped section in the cabin liner that incorporated a little storage bin. 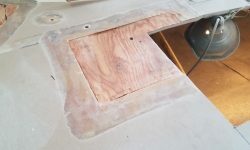 I removed all the nuts I could from belowdecks and hammered up the bolts so I could reach them from above, but the configuration of the access simply didn’t allow me the reach I needed for the forwardmost bolts. 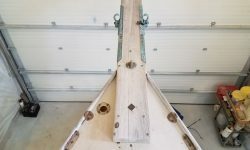 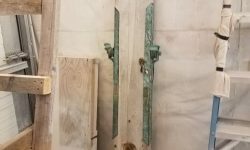 Fortunately, the way the bare platform had weathered over the years meant that the carriage bolt heads stood a bit proud of the adjacent surface, so I could easily cut the heads off with a saw without affecting the surrounding wood. 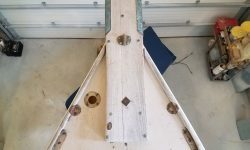 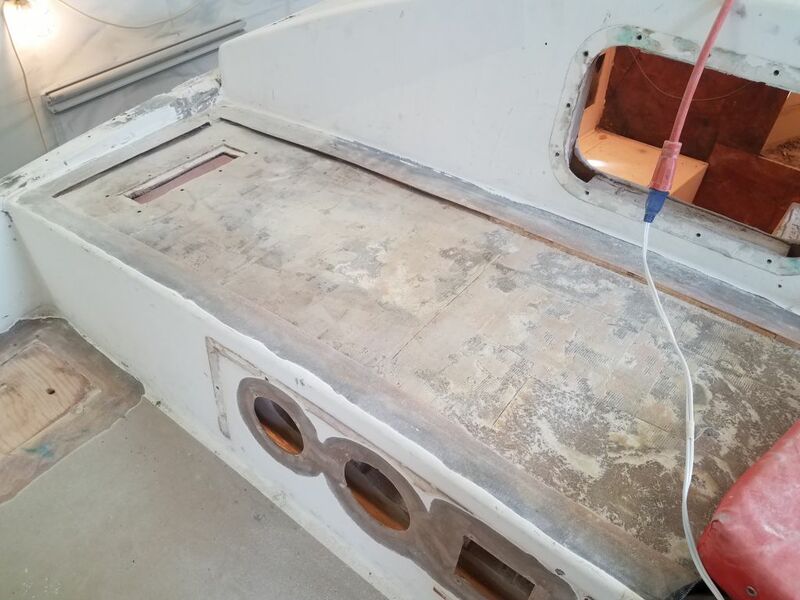 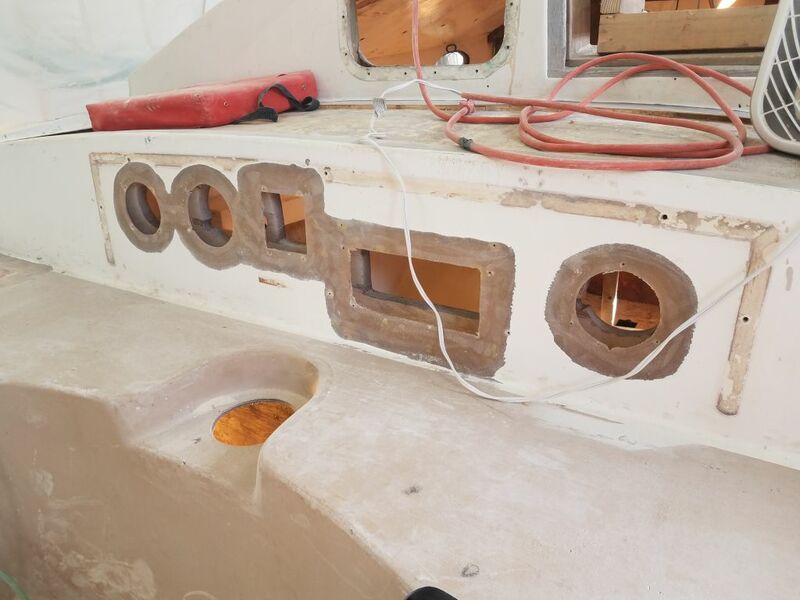 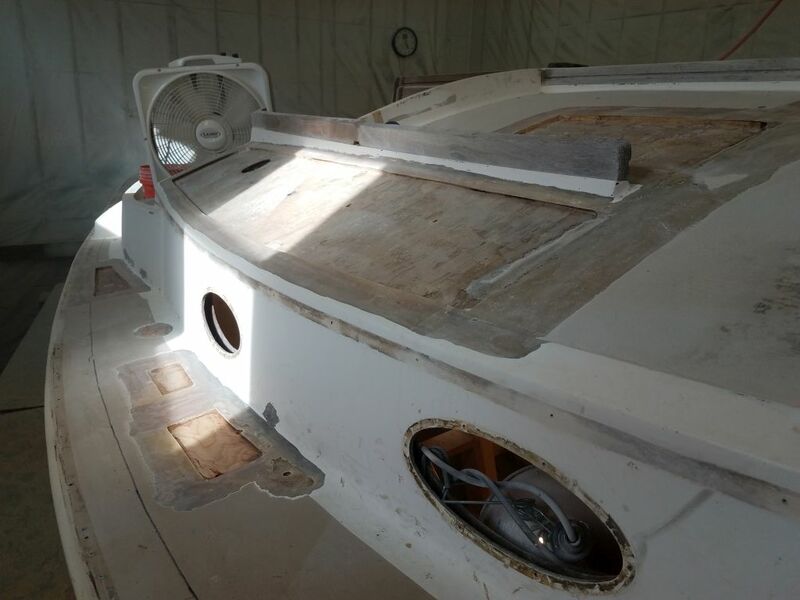 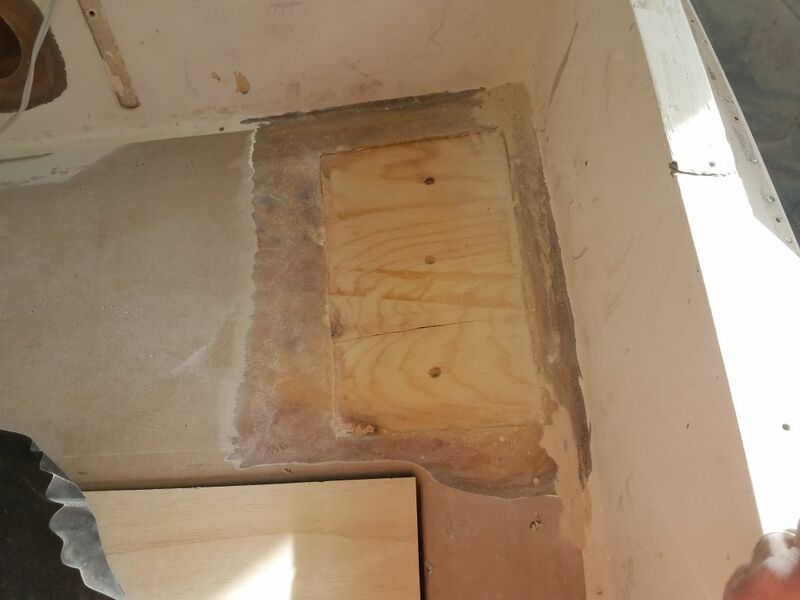 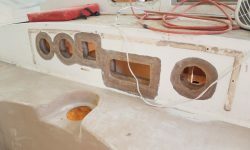 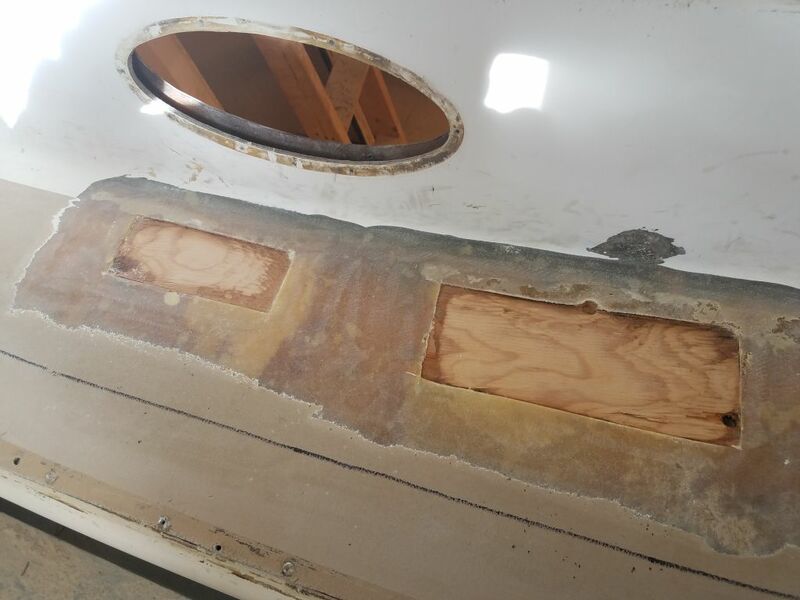 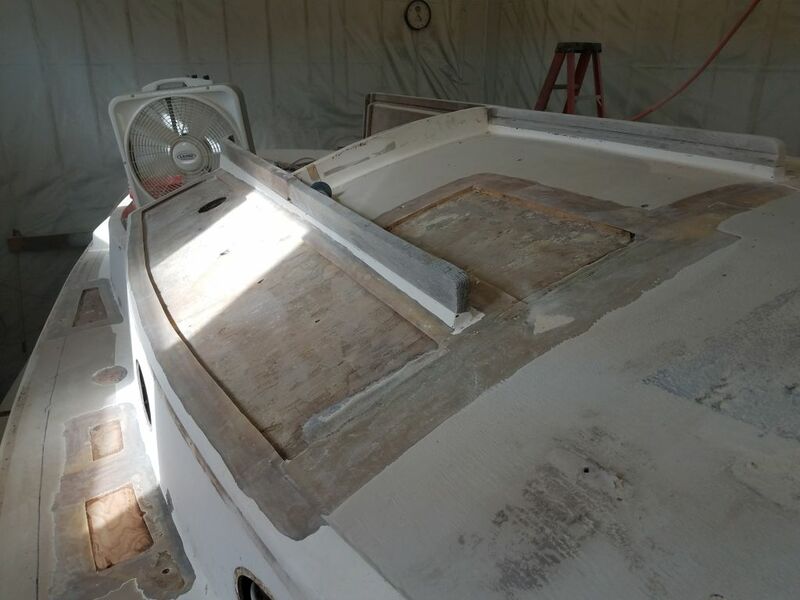 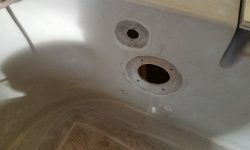 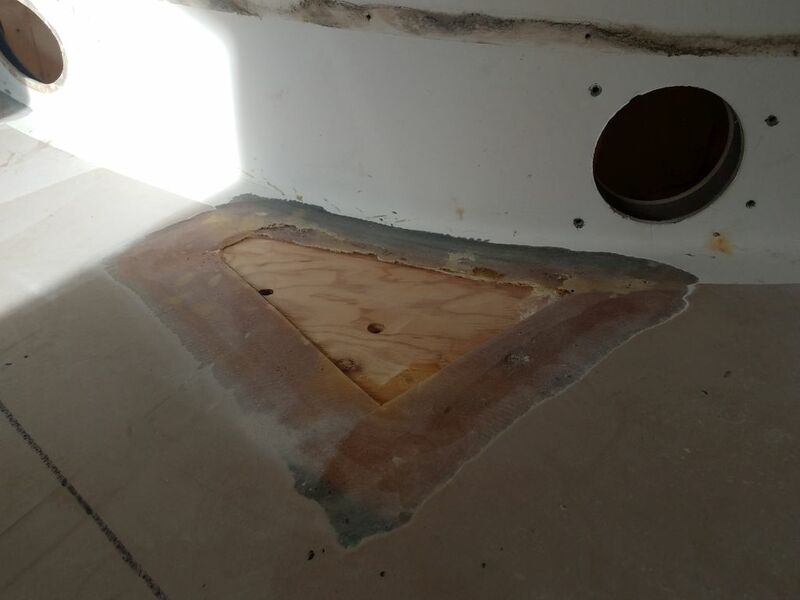 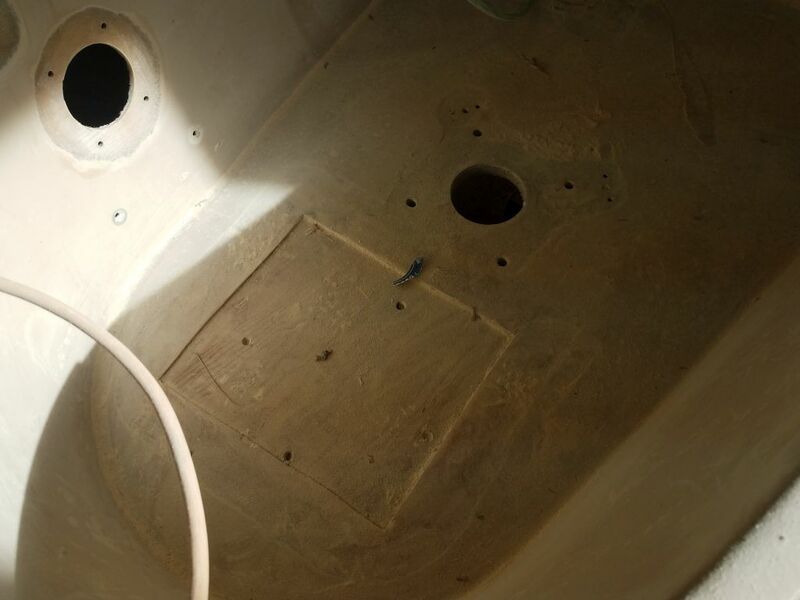 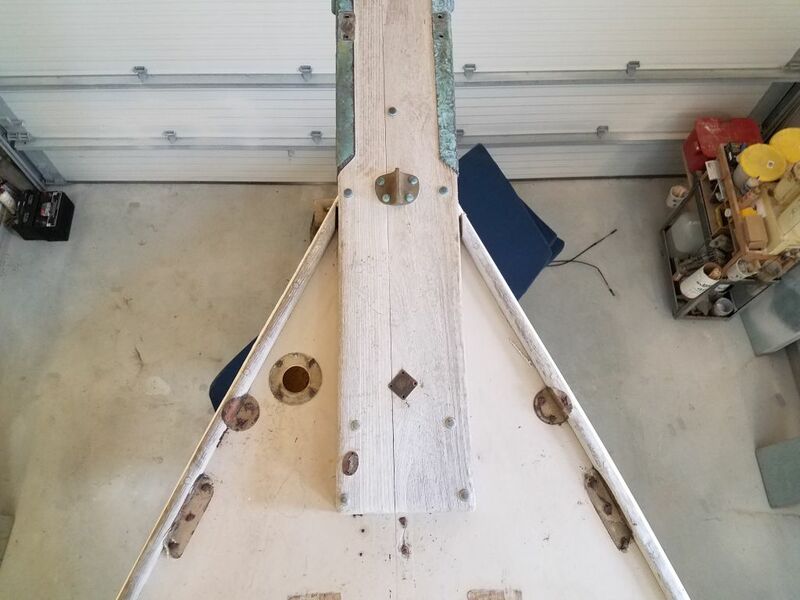 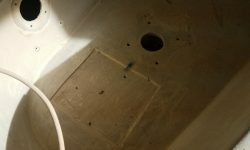 Once I had all the nuts removed and/or heads cut off, I removed or pushed the studs back down through the holes and into the boat to free up the platform, other than the sealant. 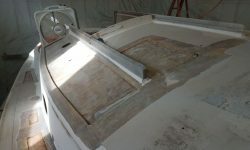 Freeing the platform, which extended over the deck by several feet, all of which was heavily bedded in the silicone, was quite a chore, particularly while being conscious of keeping the platform intact. 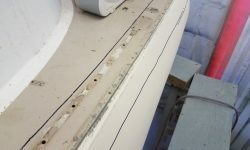 In increments I eventually managed to slowly pry up the platform, first from one side, then the other, and finally drove a chisel all the way beneath it near the stem, which helped finally start breaking the grip of the highly flexible, thick layer of rubber. 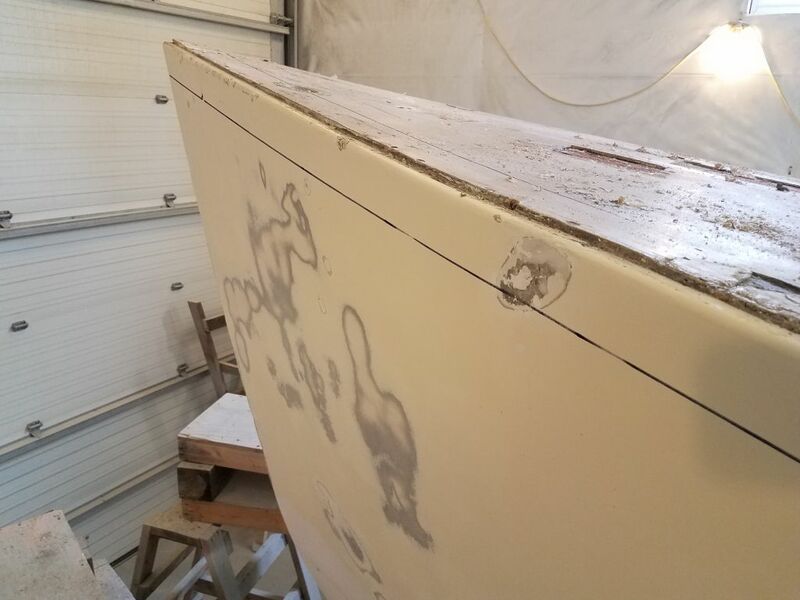 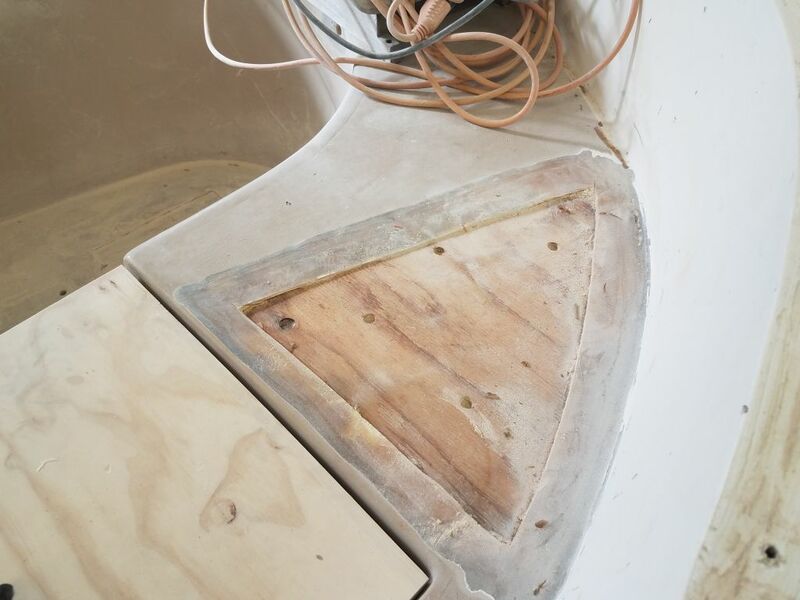 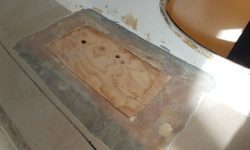 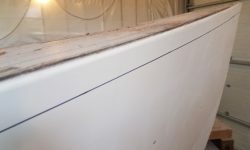 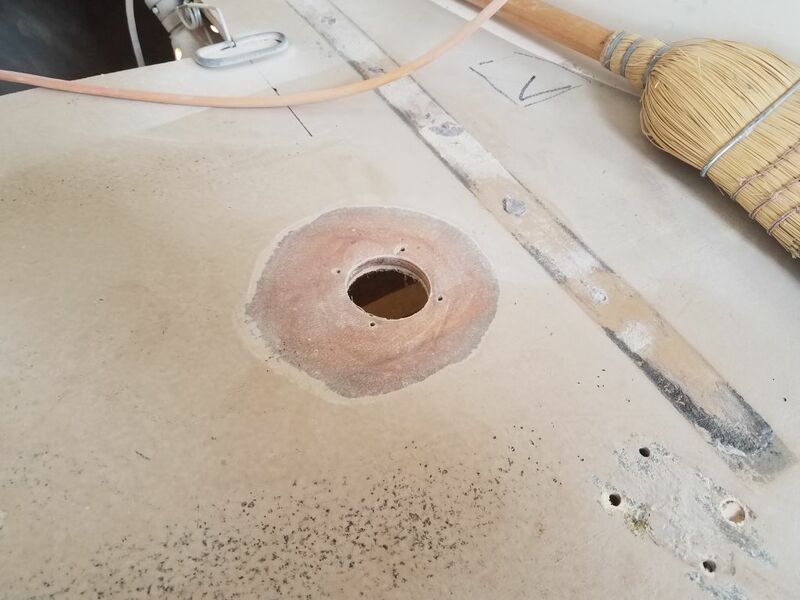 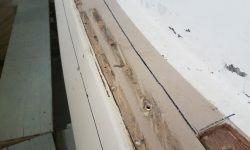 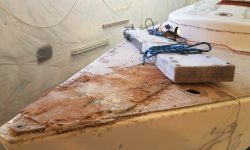 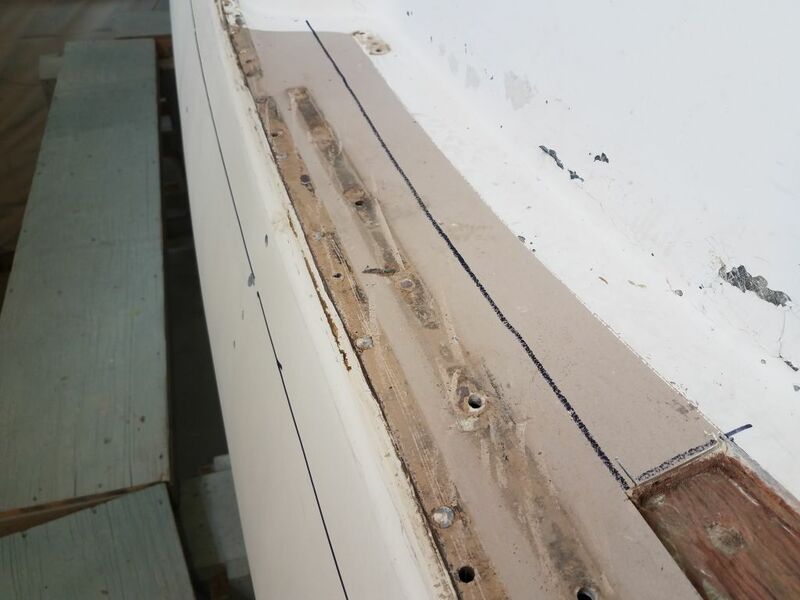 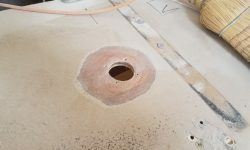 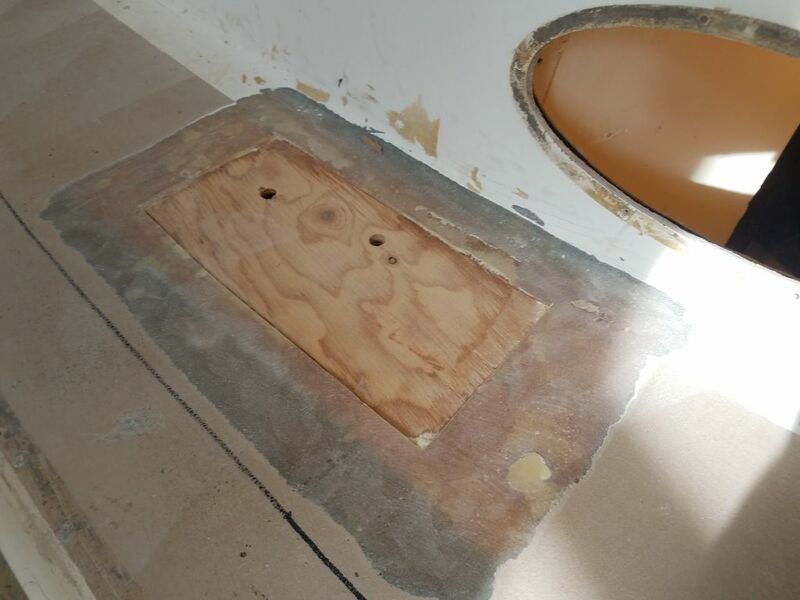 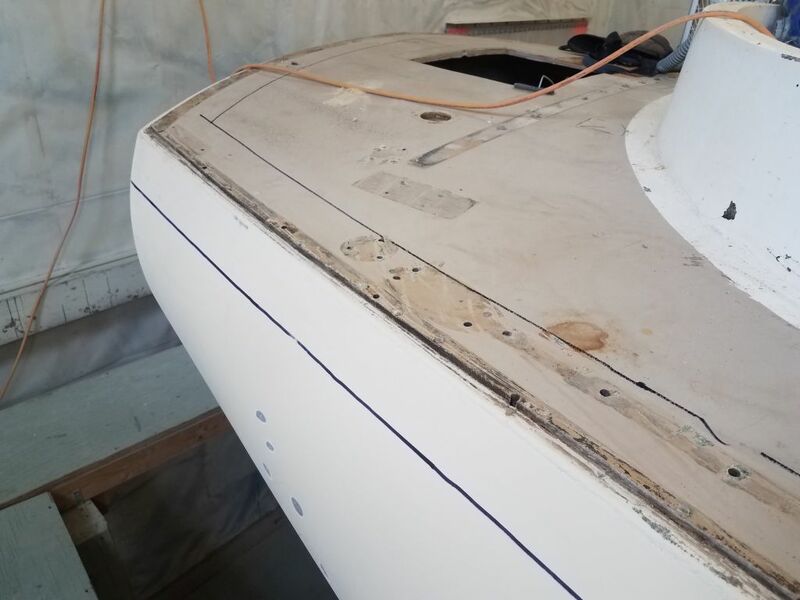 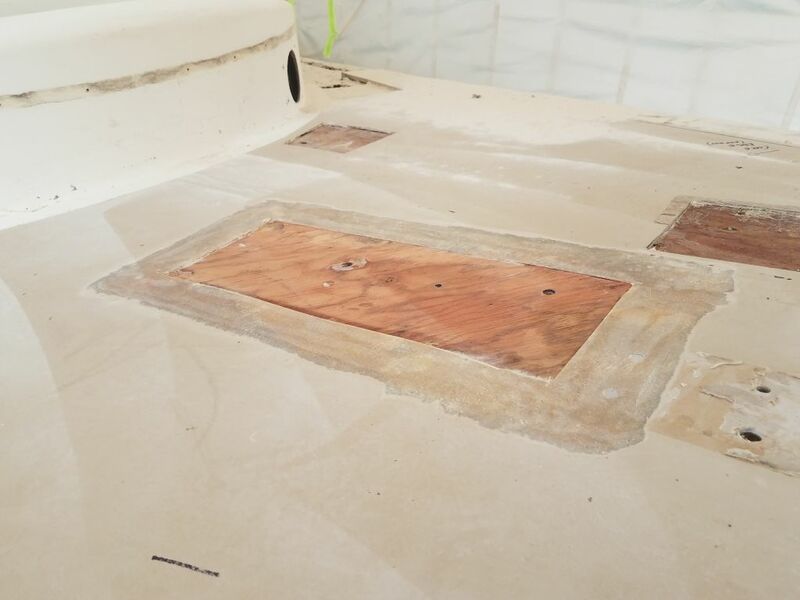 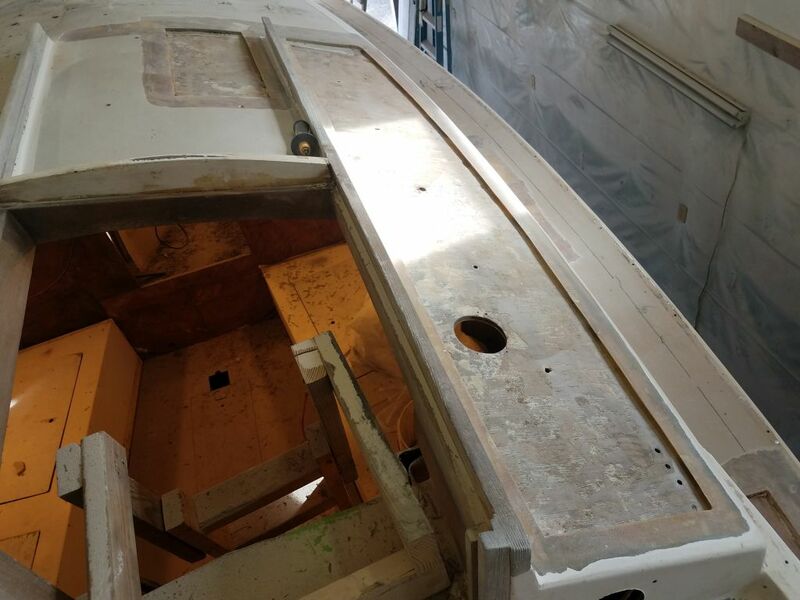 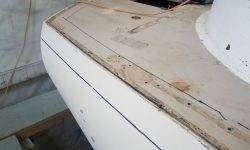 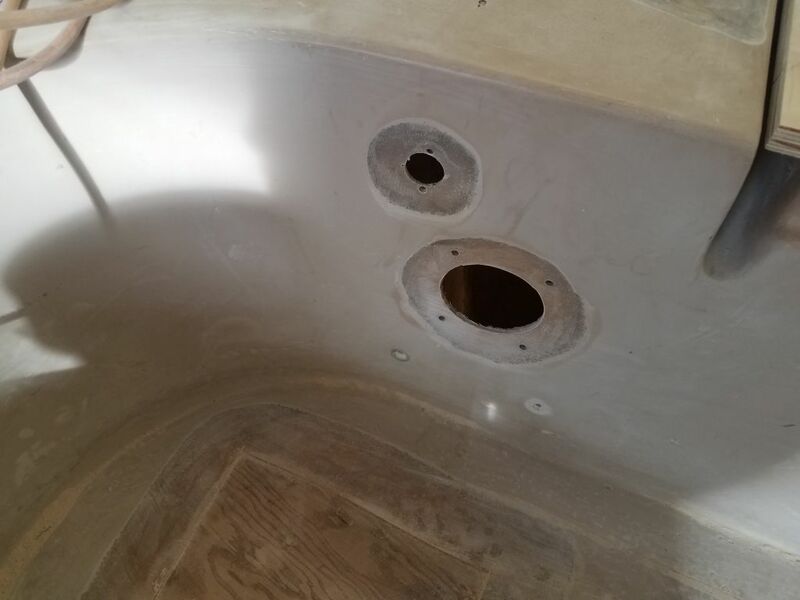 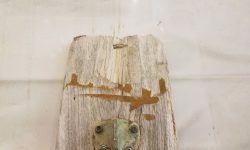 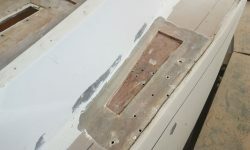 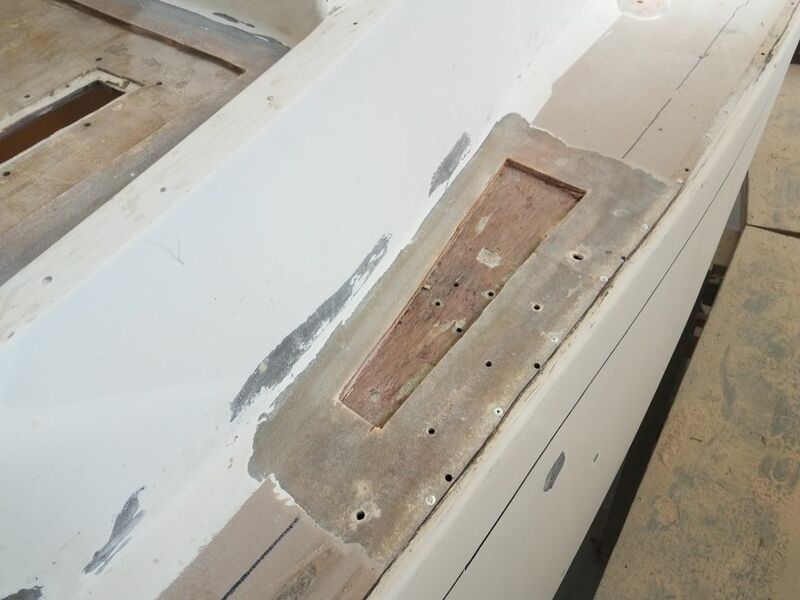 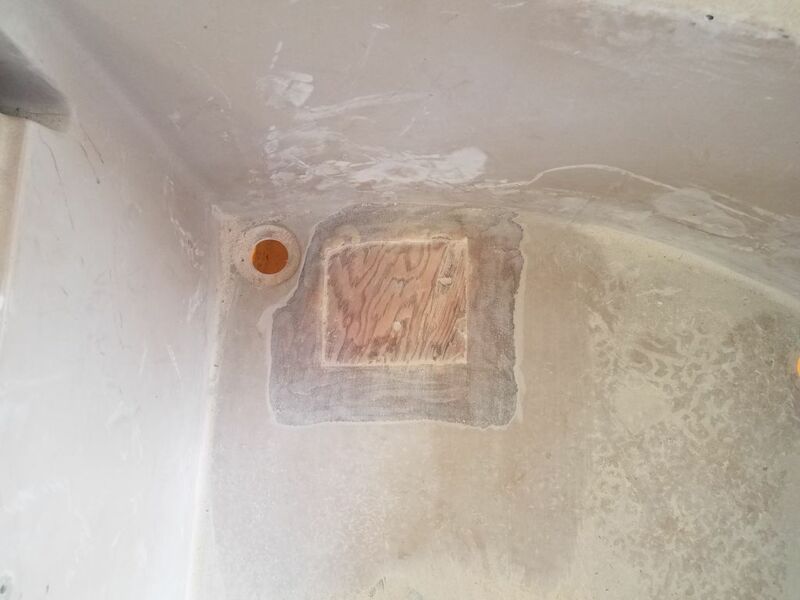 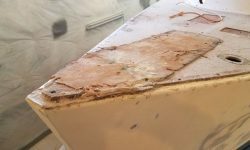 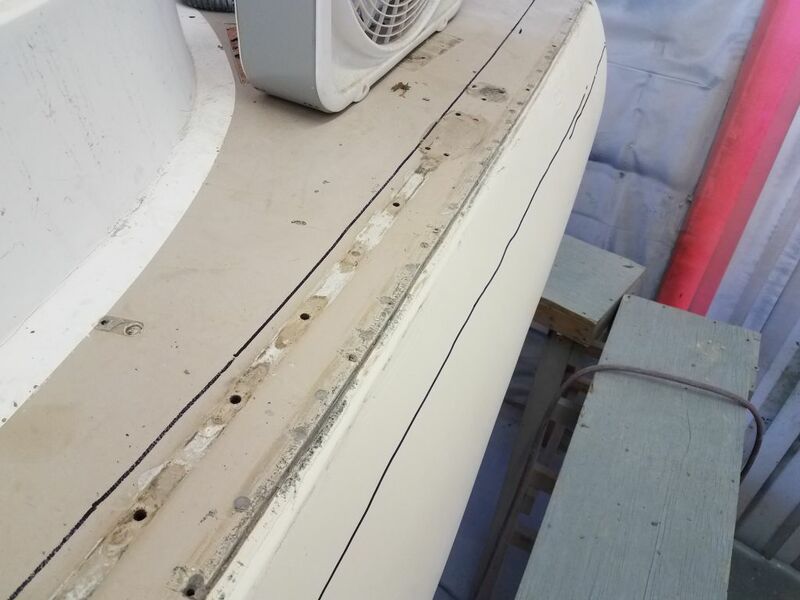 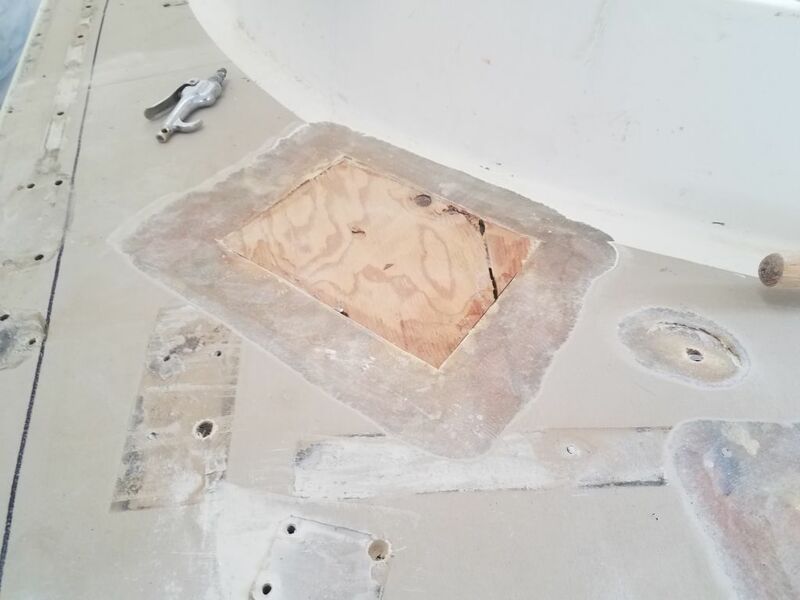 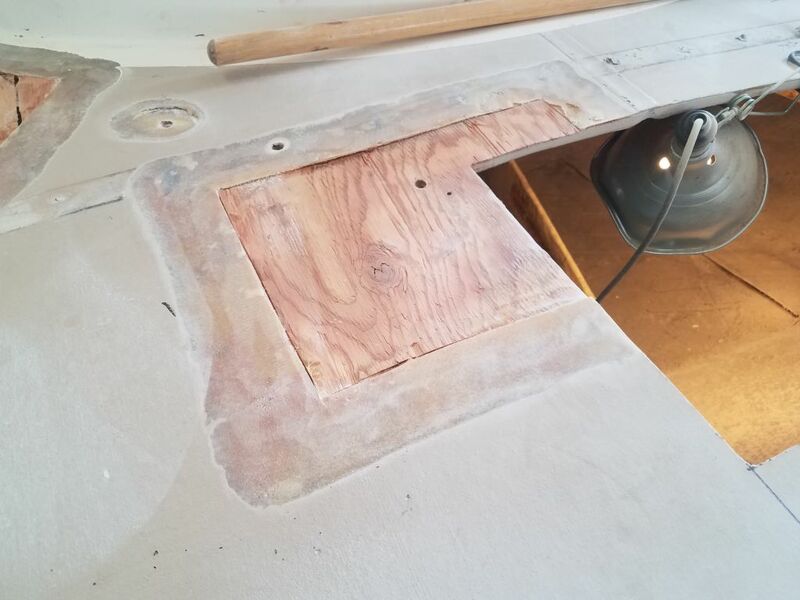 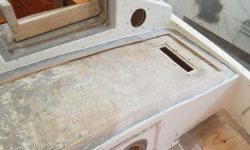 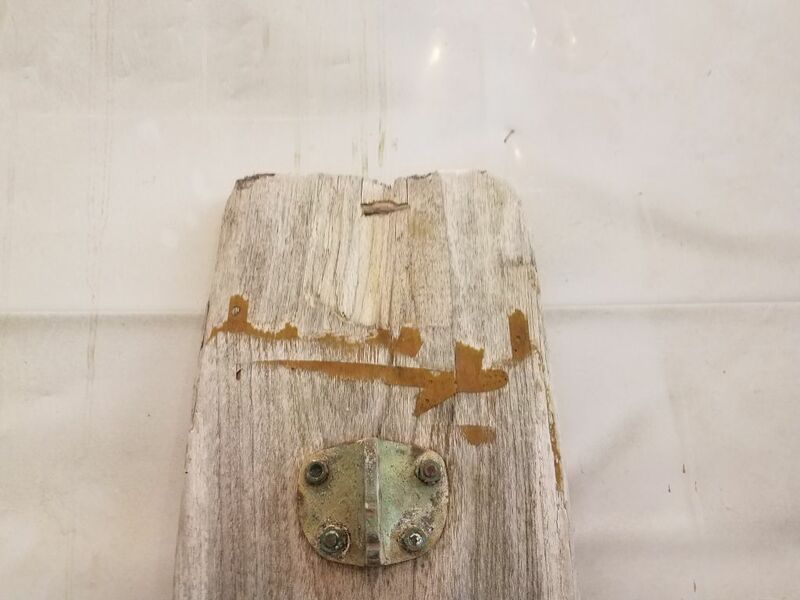 To prevent the platform, which extended further outboard of the boat than over the deck, from pivoting off uncontrollably when I finally cut the last of the silicone, I ran a small line through the aftermost pair of bolt holes and tied the platform to the boat. 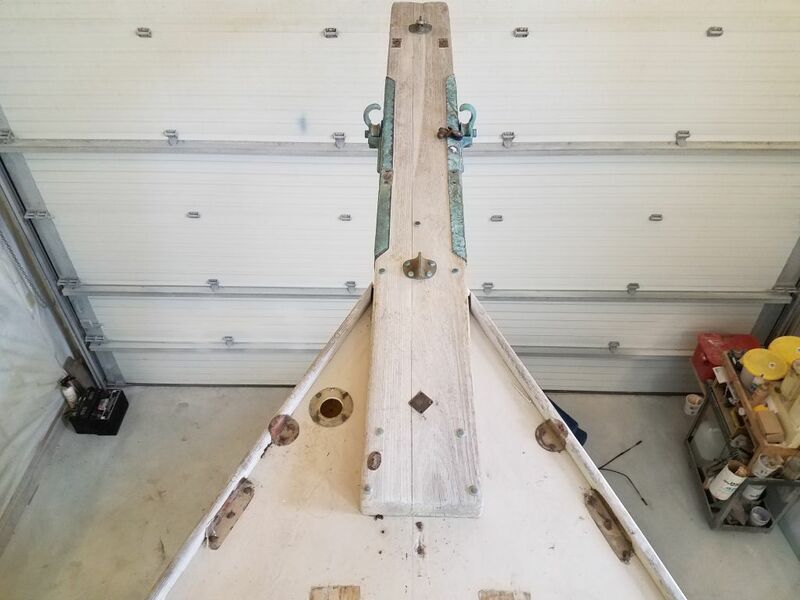 Once I finally freed the platform, I could spin it around so it rested on the deck so I could regroup and then lower it down to the shop floor. 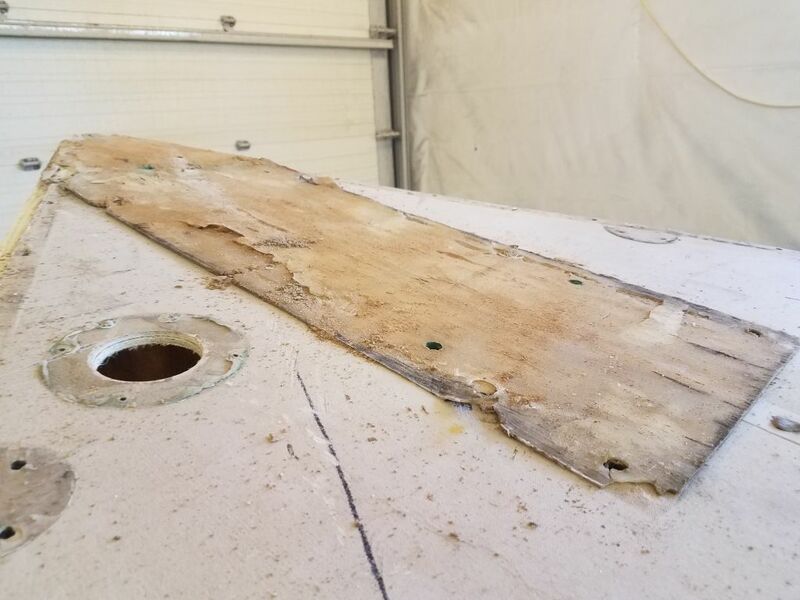 The platform was in basically good condition, with some damage at the outermost end on the underside, but heavily weathered. 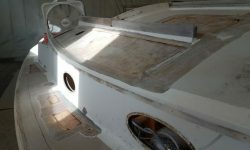 For now I could leave it be, as it would be some time before I needed to reinstall it. 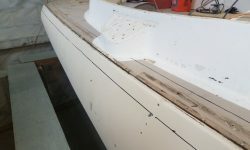 With a chisel, and then a paint scraper, I removed the bulk of the old silicone from the foredeck. 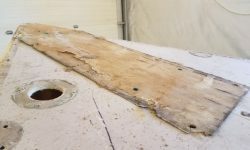 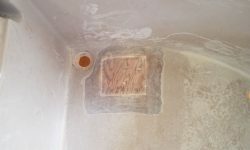 The layer was about 3/16″ thick over most of the deck. 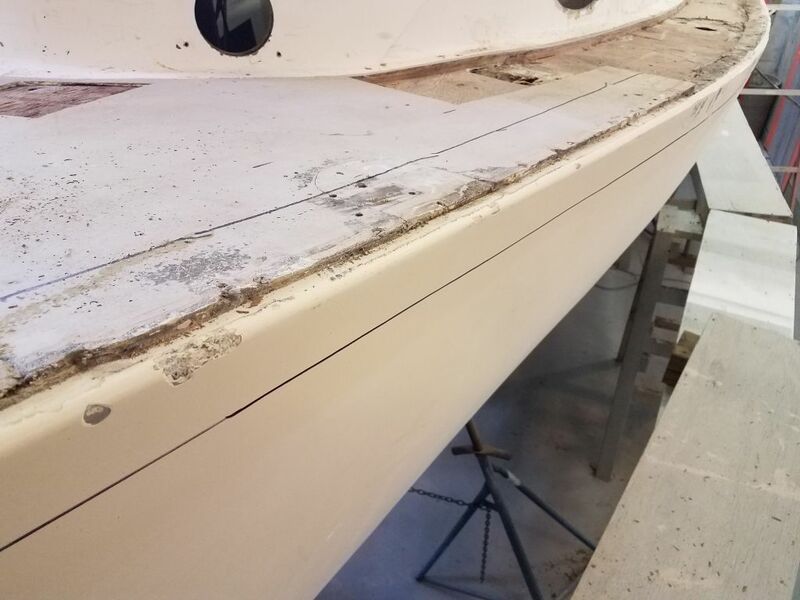 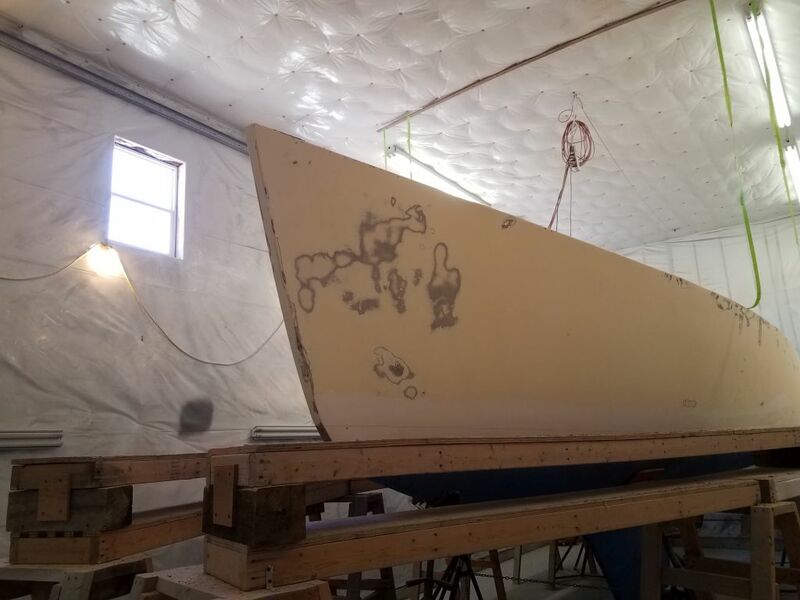 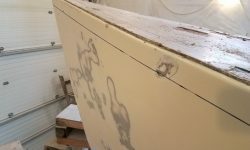 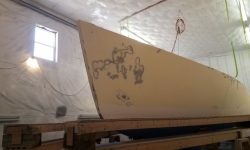 Preparing for several days of heavy sanding work ahead, I made some reference marks on the hull and deck on either side of the gunwale to indicate how far to remove paint or gelcoat for the hull/deck reinforcement. 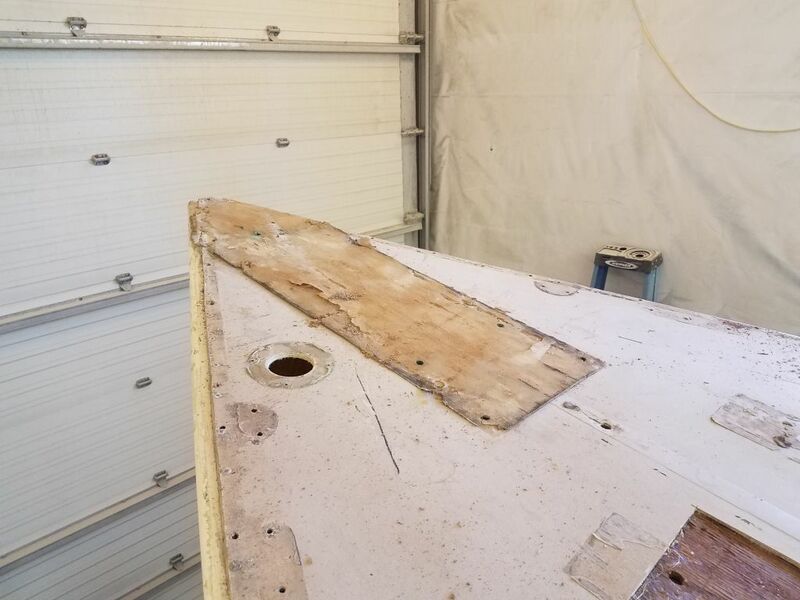 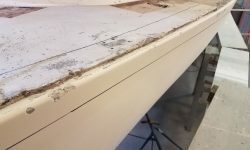 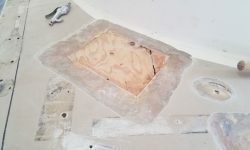 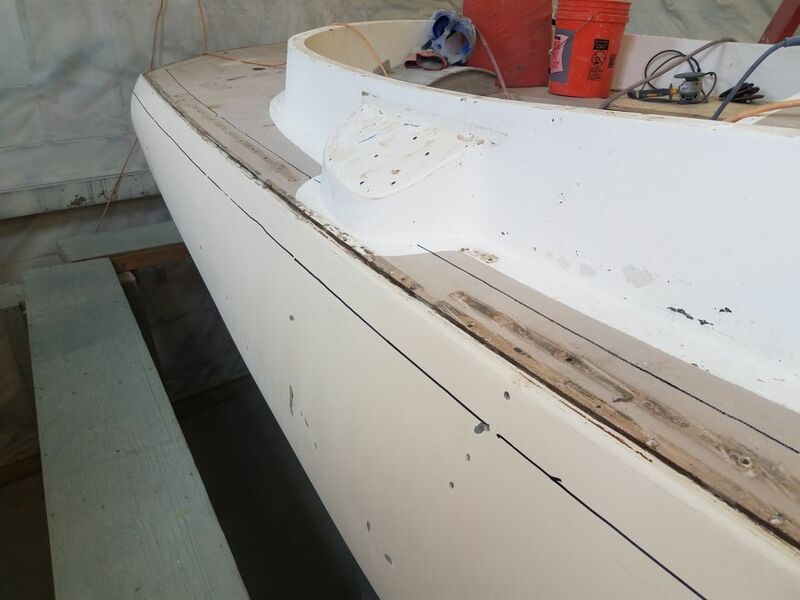 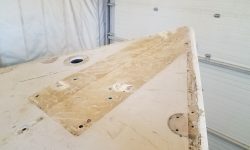 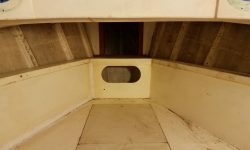 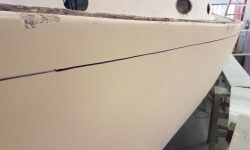 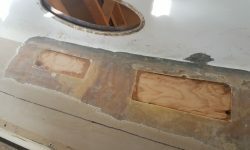 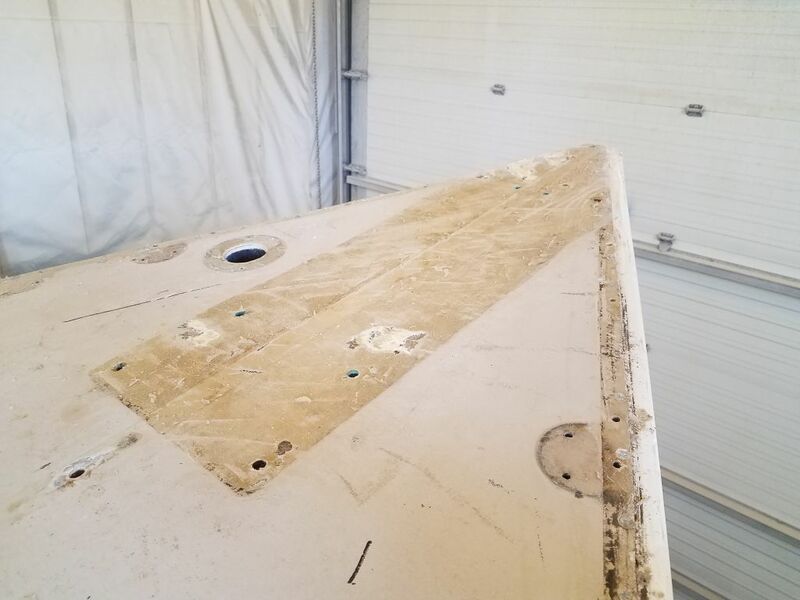 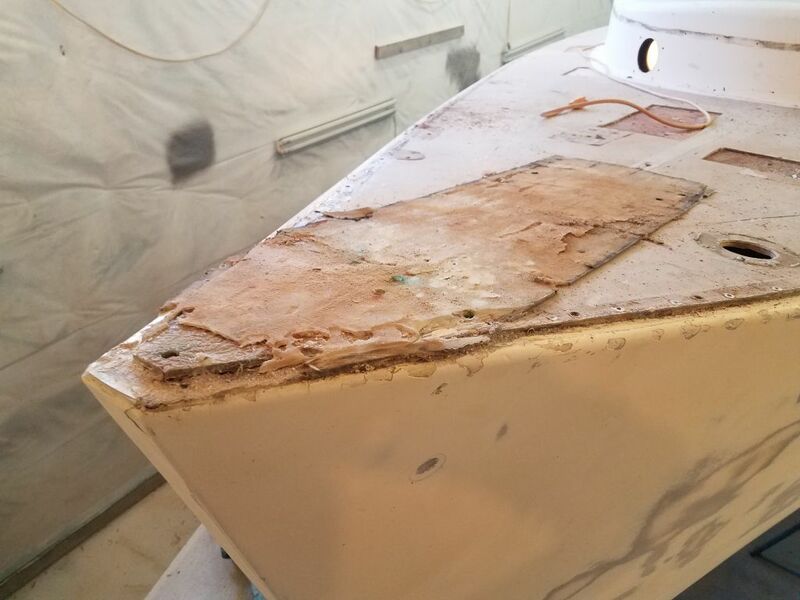 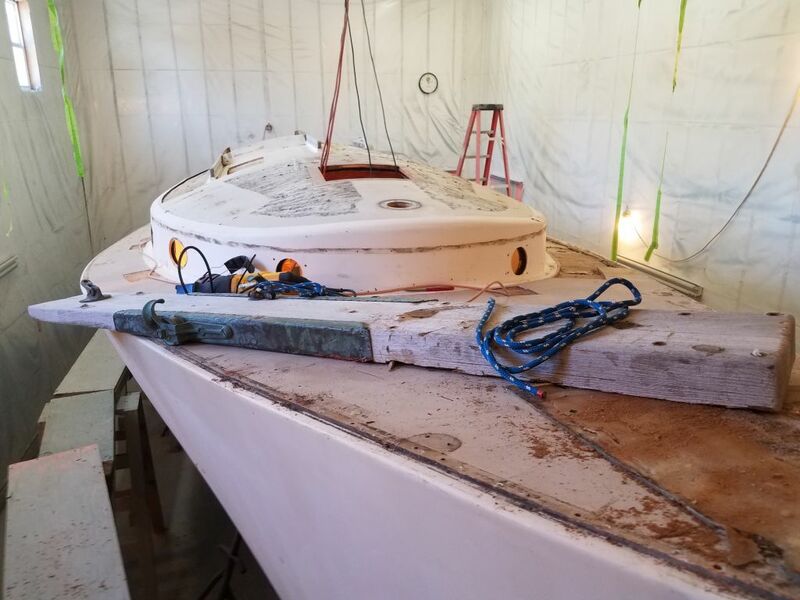 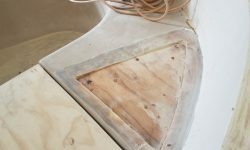 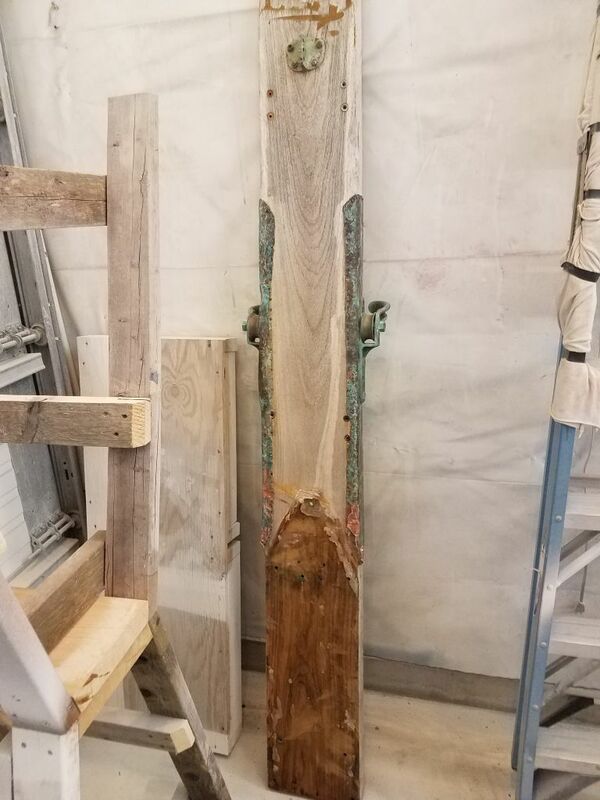 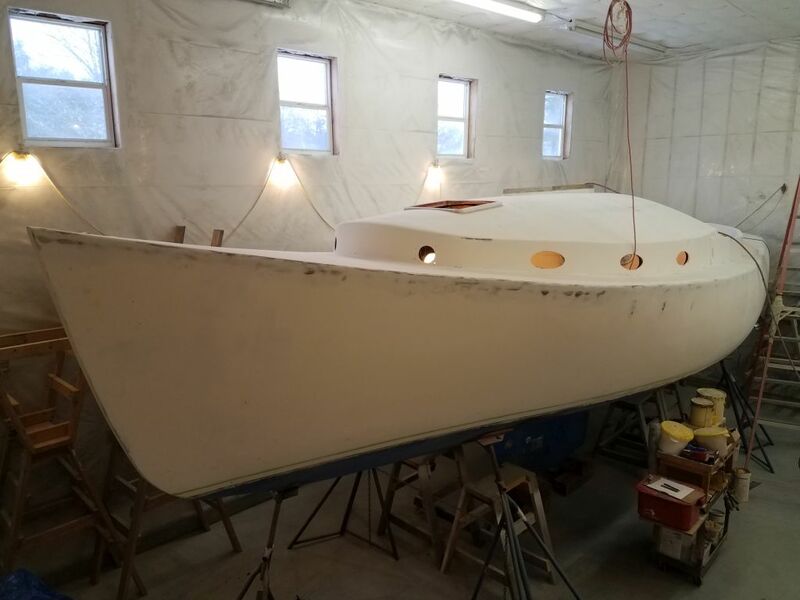 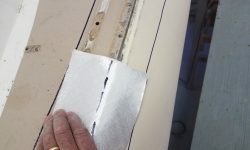 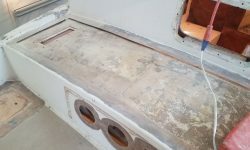 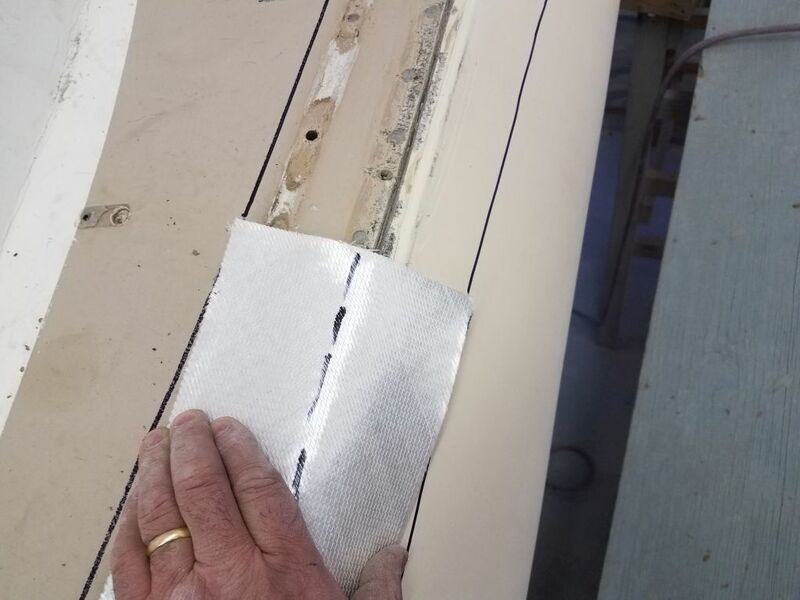 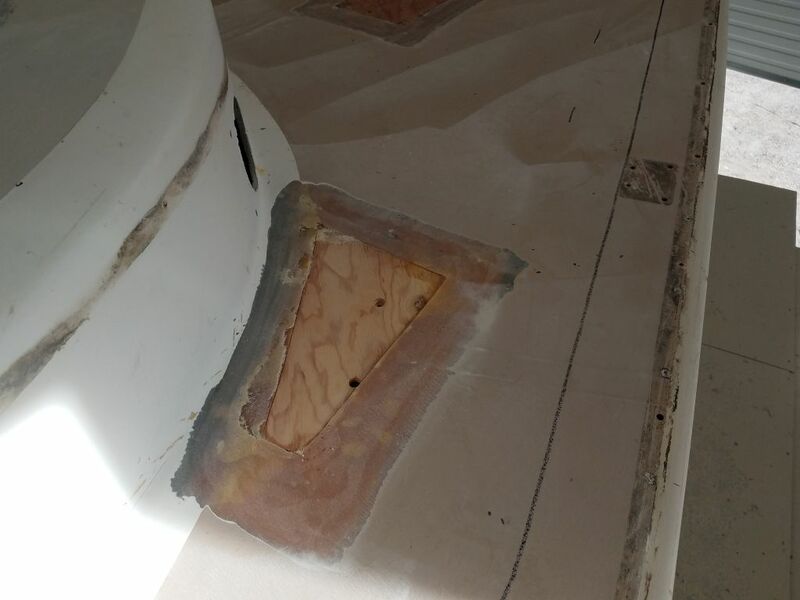 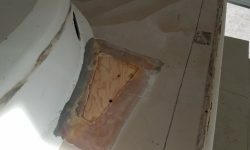 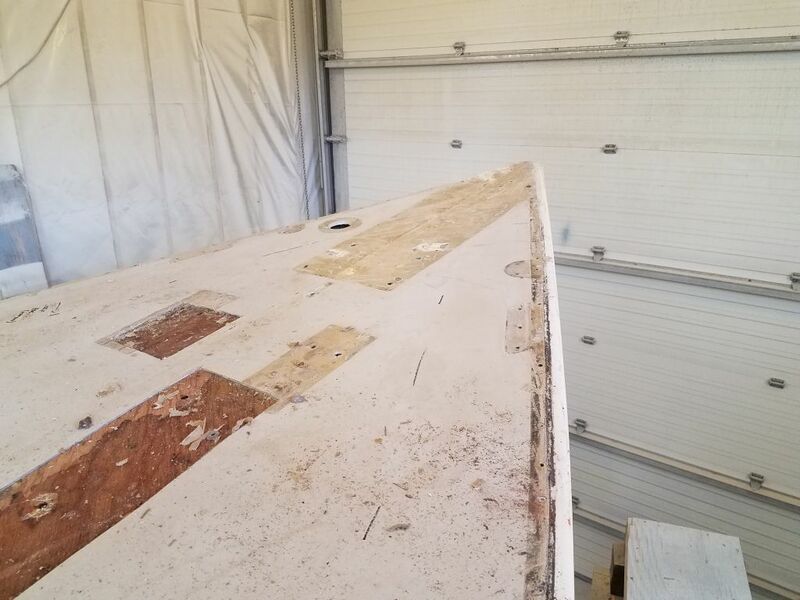 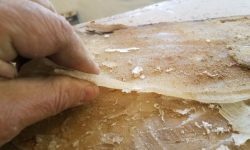 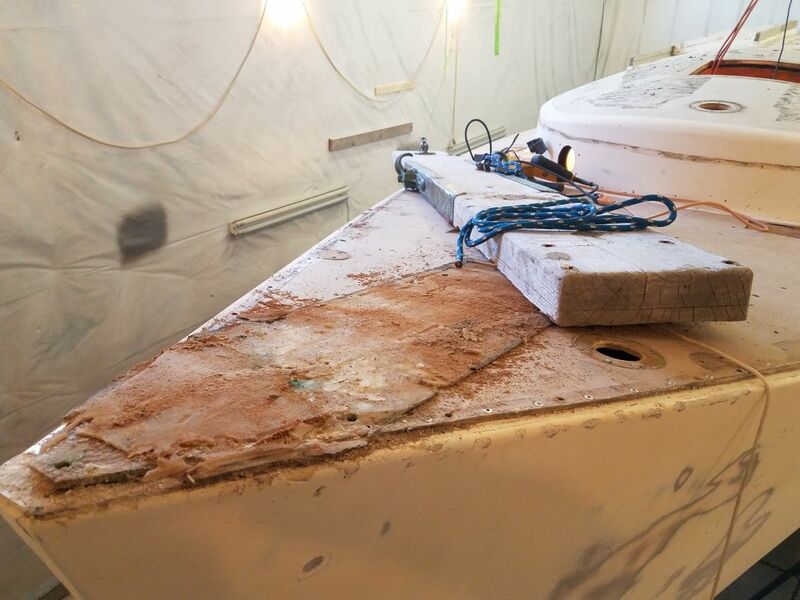 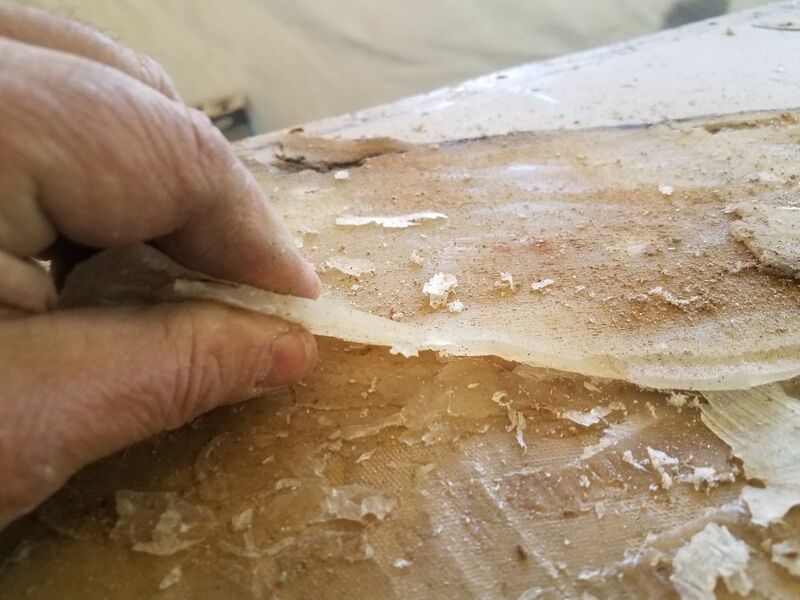 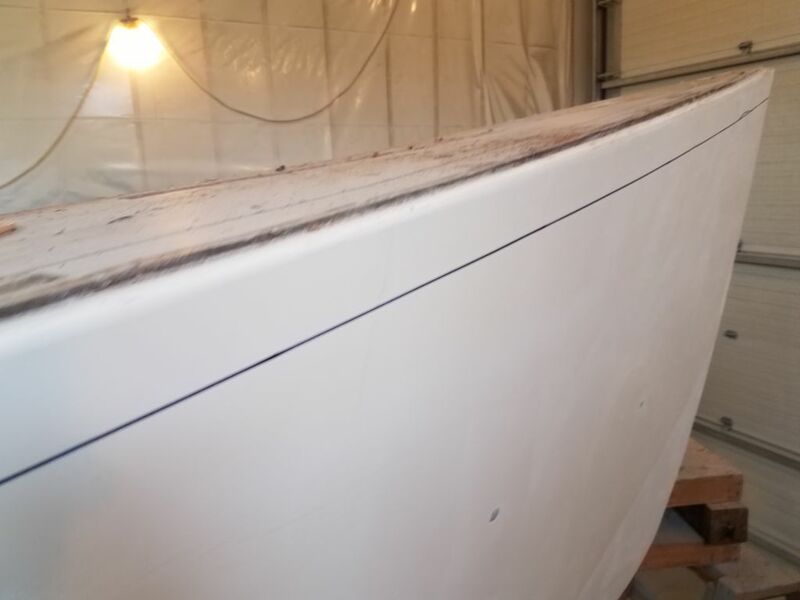 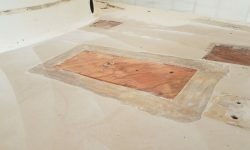 During the remainder of the day, I used a grinder to prepare the edges of all the areas to be recored and relaminated, removing gelcoat and creating a slightly tapered raw fiberglass edge over which the new work would eventually bond and tie in the repairs with the existing structure. 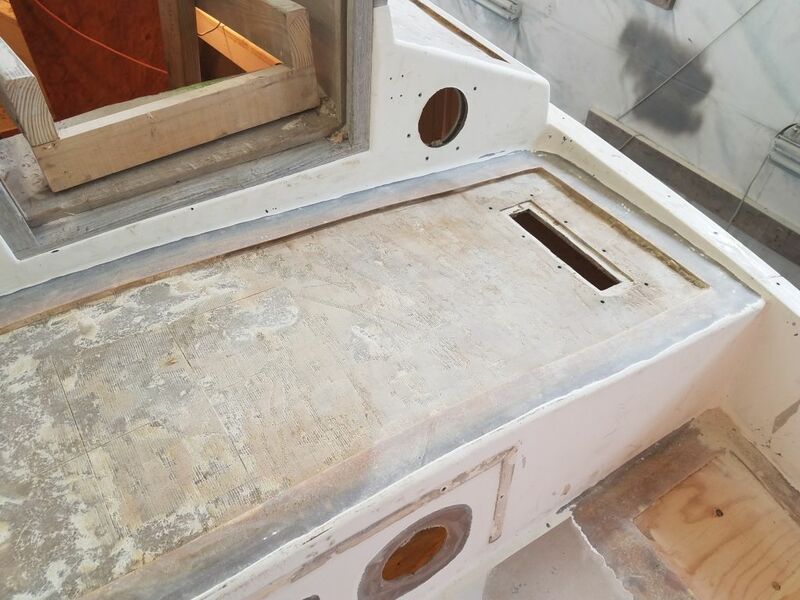 I also cleaned up the inner deck skins and top of the original plywood core as needed. 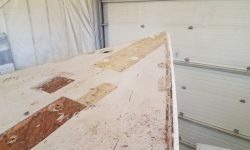 In this session, I completed the work on the starboard coachroof, bridgedeck, cockpit, starboard sidedeck, starboard foredeck, and poop deck., leaving the port sidedeck and other areas for next time.